You Need Home Treatments For Dry Skin? Do you have a dry skin problem that drives you crazy, and no matter what you do, you can not get rid of it? I know, that can be very frustrating and harmful for sensitive skins. No matter the brand of cream or lotion we use, it will just don’t do any good. Luckily, there are some other things that we can do for fighting with the dry skin, even at home. That’s right, without spending a lot of money or time, you can get rid of dry skin by yourself. I can hear that you are screaming now and say, “Hey! I have tried almost everything, but no matter what I do, this skin does not get any better!” I know, I have been there and done all too. But later on, I have found the real solutions for my own dry skin problem. And now, I want to share the things I had to learn and used myself. The tips that I will give you guys here are the best methods of home treatments for dry skin. How to Take Care of My Dry Skin? Did you know that one of the best products for getting rid of your dry skin is defatted milk? That’s right! First of all, you need to use defatted milk as your makeup cleaner. Every morning and night you need to clean ur face with ur defatted milk. Clean your makeup with it. But the trick to not washing it right away. Let it set on your face minimum for 10 minutes. After 10 minutes you can apply your moisturizing cream. Other then defatted milk, when you are cleaning your makeup, you should always use dense and oily face cleaner and moisturizing tonic. When you put cream under your eyes make sure you apply the cream from inside to outside, not outside to inside. If you have such a skin problem you also need to be careful about your environment, these home treatment for your dry skin tips will help you, but you need to keep your skin away from too much sun, cold or wind. Because you do have dry skin, you should try to avoid to get sweaty. Always use strong facial cleaning products. And after you clean your face with it, rinse thoroughly. Because of the sensitive, dry skin, summer or winter all the time use some extra cream or lotion for your face. Keep your face from cold or heat. And the last tip for the home treatment for your dry skin is, if you can use beauty masks on your face, always prefer mask made from banana and cucumber. 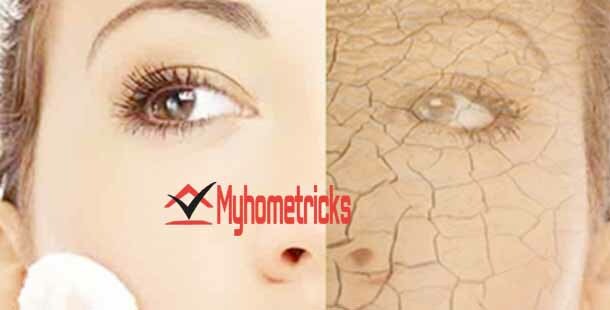 As myhometricks.com we do like to say that dry skin is not a joke. Those skin type can be a problem in the long term. As your age goes by, your skin will not go hide your problems and wrinkles as the oily skin does. So, take care of your skin much as possible and early as possible. Try to avoid to make much up. If possible try to pay more attention to moisturizing creams. Tip: For more information on this issue, click on the “tags” below.